The standard British service rifle is the bullpup SA80, using the now ubiquitous 5.56 mm round. While this rifle has had a rough beginning, it now is plenty good enough to get the job done. But, as with all modern assault rifles, the low power round does have it's disadvantages. On the plus side, a soldier can carry gobs of ammo, and the rifle performs well in close quarters combat. The 5.56 is criticized for it's lack of knockdown power, so it's a good thing ammunition is light enough to carry a lot. It's effective range is about 300 meters, the same for M-16s, but the bullet will only reliable tumble out to 150 meters or so. This is a big deal on the knock down power of the 5.56 round. The British are facing a guerrilla force in Afghanistan that has a mismatched set of firearms, but of those firearms are a lot of old Lee Enfields, capable of firing a full power WW2 style bullet. The CIA flooded the country with these old Enfields during the Soviet unpleasantness, and even old and worn out, they are still formidable guns. The Taliban would be easily outgunned in a pitched battle at close quarters, but they are seldom into that. The occasional sniper at long distance gets lucky mainly because they have a long range gun, and they usually get the first shot. The British are evening up the odds with an influx of sniper guns of the 7.62 variety, which are plenty lethal at long ranges. 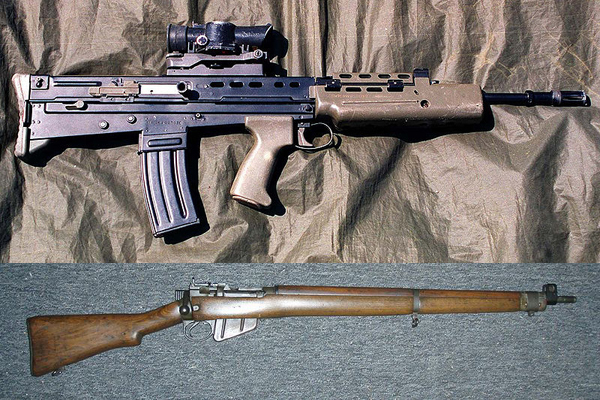 The old WW2 rifles may have passed their heyday, but they are still something to be reckoned with.